Taylor Guitars want a few things to be clear - they are not a legacy guitar company. They are not a company that relies on musician’s of the past hocking their guitars and they are not a company satisfied with resting on their laurels. Taylor is driven to continue to innovate and stretch design ideals into new territory, and that is exactly what they have accomplished with their new V-Class bracing design that has just launched this year. In acoustic guitars, the strings are plucked sending vibrations from the strings through the bridge and saddle. Those vibrations then travel through the guitar’s top or soundboard, generally made of tonewoods such as spruce or cedar. This top piece of wood is often only a few millimeters thick and must be strengthened by internal bracing. For centuries the theories regarding how to build a strong and reinforced internal bracing system for acoustic guitars remained a battle of compromise. More volume and sustain meant less strength and durability and vice-versa. Classical guitars, which use nylon strings and generally have less tension often use variations of a fan bracing system (see pic below) developed as far back as the 19th century. However, as materials for strings changed and larger bodied acoustic guitars came into popularity, Christian Frederick Martin, the founder of Martin guitars developed the X-bracing system around the mid 1800’s. The X-bracing system consists of two braces in the shape of, you guessed it, an “X” (see photo). These braces run underneath the soundboard below the top of the sound hole and reinforce the bridge. Two to three more braces, called tone bars add more stability and balanced sound. The X-bracing design was innovative and adopted by nearly every luthier making steel-stringed, large body guitars. Further development of this design continued and the introduction of scalloped X-bracing was introduced. This allowed a luthier to carve out portions of the bracing, reducing weight and improving sound and tone control even further without losing the strength this design offered. 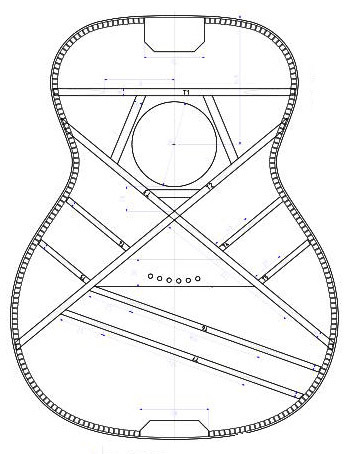 For over 170 years X-bracing has ruled acoustic guitar design until now. Andy Powers joined Taylor in 2011 because he appreciated Bob Taylor’s approach towards guitars. Problem-solving and solution-oriented building drive Bob’s facility and business model. It was a match meant for greatness as Andy spent his time tinkering with improving Taylor’s builds year after year. Wood thickness was optimized for each different body shape, protein glue was used and an ultra-thin finish developed to really bring out the tonal qualities of Taylor guitars. Andy felt that he had worked on improving nearly every aspect of the guitar besides the bracing design and knew this was the next step. Andy Powers and his V-braced design innovation. Photo courtesy of Taylor Guitars. It was while watching an early morning surf session from a bluff on California’s coastal surf breaks that an epiphany came his way. While watching waves break against a jetty he noticed the fluidity that occurred as the waves hit the jetty and split off to each side in a smooth “V” shape. Water waves react just like sound waves but can be seen in real time and it hit Andy immediately. He began sketching the waves splitting in perfect V-formations against the jetty and then overlayed a guitar’s top to this sketch. His hunch was that his V-shaped bracing should retain and even add stiffness length-wise producing more volume and more sustain. Early prototypes of his initial design proved his suspicions but also unveiled another perk to this design. It allowed for even better intonation for the entire guitar meaning chords ring truer and sound better no matter where the player is positioned on the neck. Harmony in chorded notes had never sounded better giving more freedom to the player in knowing that sonically, chords would never sound “off” again. Andy Powers refines a V-Class System build. Photo courtesy of Taylor Guitars. Taylor is rolling out their V-Class System bracing by introducing it at the top of Taylor’s line up for 2018, but will eventually offer it on all of their Grand Auditorium shapes, the most popular of their design models. For now though, to hear and feel the new design players can select among the PS14ce, K24ce, and 914ce models. At Arizona Music Pro we are already taking pre-orders for the K24ce and will stock V-braced guitars as Taylor begins shipping them out, but they won’t last long so be sure to check up on our inventory regularly! Bob readily admits that Andy Powers is not just a replacement for Bob’s initial design ideas, but a full improvement. Bob says “I know I sound like a proud dad, but I honestly believe that with our manufacturing capability, Andy could have more impact on acoustic guitar design in the next forty years than anyone alive.” For Taylor and the players that are rediscovering their passion for acoustic tone, just like Bob did, the future is looking brighter, fuller and clearer than ever. Newer PostPre-Order Taylor's NEW line of V-Class Builder's Edition Acoustic Guitars!